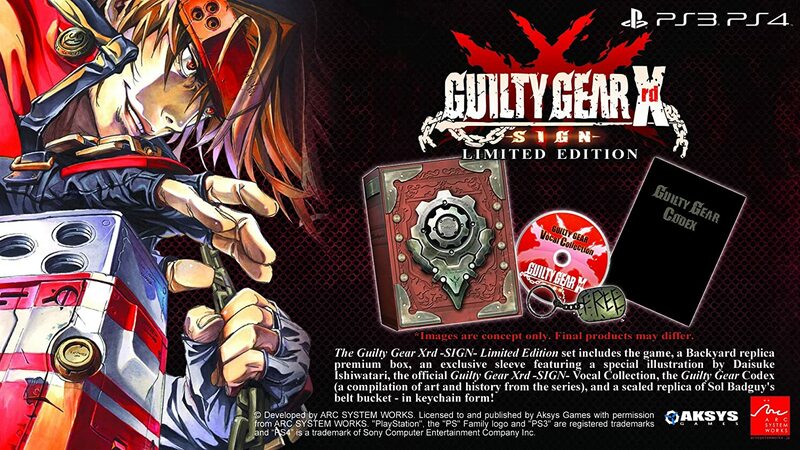 Amazon has the first look at the U.S. version of Guilty Gear Xrd Sign Limited Edition. We get to see the Backyard replica premium box, Vocal Collection CD, Guilty Gear Codex (featuring the artworks and lore of the series), sealed keychain replica of Sol Badguy’s belt buckle as well as a special slipcase designed by Daisuke Ishiwatari. Preorder the Limited Editions right now on Amazon – PlayStation 4 version and PlayStation 3 version. Check out the photo of the product below this paragraph. Guilty Gear Xrd Sign is developed by Arc System Works, the same people that created the prior games of the franchise along with BlazBlue and Persona 4 (including the recent release of Persona 4 Arena Ultimax). Their latest project is coming out on the 16th of December. Instead of the 2D sprites, the team went with 3D cel-shaded graphics. The results have been excellent from a visual standpoint, especially on the current-gen PS4 console.